Sometimes injuries and bad weather force us to ride indoors. Riding indoors requires you to invest in a quality bike roller. Modern bike rollers on the market feature very easy operating mechanism where you simply mount your bike and start exercising right away. When buying a bike roller trainer, pick those made from the high-quality materials. In this article, we will narrow the search for the best bike rollers on the market by bringing you rollers of the best quality. These are the top picks on the market with good value for money. Rad through as you plan to choose what best suits your needs and desires. The Nashbar is a great choice to start our list with CNC machined aluminum drums. This is an efficient roller that operates smoothly and quietly. It is 85mm in diameter and features a sealed cartridge for the efficient operation. 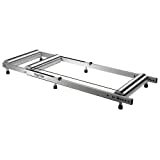 The aluminum frame measures 50”X18” and comes with nine settings that accommodate any wheelbase. This is a quality pick that protects the floor of your house with three sets of feet fitted with non-marring plastics. Durability is assured with a polyurethane connecting belt. This is a lightweight and portable bike roller and a good choice for people on the go. It easily folds into a compact size measuring 22”X22” X9” and can easily be stored or transported with ease. The roller has curved edges which help you stay on the roller when riding. Bearing are sealed to allow for smooth and quiet operation. Overall, this is a versatile bike roller compatible with 27” and 700c bikes. There are ready steps for you to mount and unmounts it with ease. This roller comes in a parabolic shape making it easier for you to stay in the center of the rollers as you ride. It is a perfect choice with a sealed bearing to give you a smooth, quiet and efficient operation. The pedaling action will closely simulate the road experience. The design is lightweight and foldable for easy storage and transport. Overall, this is a versatile bike roller that fits wheelbases ranging from 37” to 43,” and a much check out. 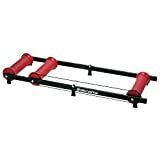 This is one of the best bike rollers on the market when you consider value for money. 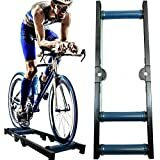 It is an affordable product but one that matches with most high-end bike rollers on the market. It is a great pick for beginners or individuals looking for a middle-level roller. It is a high-quality roller that has undergone strict testing in the factory for quality. It has an adjustable belt and a durable aluminum frame. It also comes backed by a five-year warranty to give you confidence when buying. 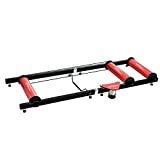 Parabolic bike rollers are known for their enhanced safety features than straight rollers, and this Conquer Indoor bike roller give you the highest safety levels. The parabolic shape will keep you at the center and prevent you from sliding. It is a versatile bike roller with a sealed bearing to give riders a smooth and quiet operation. You can mount the roller and unmounts in a few simple steps. Overall, this is a versatile roller compatible with 27” and 700c bikes. These are a precision-machine roller and a great choice coming in a cri-fold design to allow for easy storage and transport. They are made of aluminum and measure 3.5 X14.7 inches. They are an adjustable option that can fit any wheelbase ranging from 38.5 inches to 43.3 inches. The rollers have also been dually grooved for easy left or right dismount. They come backed by the unconditional Lifetime Warranty. This is a precise and fiber reinforced bike roller design to function for long without losing shape. The reinforced composite frames of the roller ensure it remains precise over a long period. It has smooth 3.5” wide and balanced rollers. The bearings are also sealed by a durable elastomer belt giving quiet and consistent drive. The front and back wheel can also be adjusted in ten increments to accommodate wheelbases of 37” to 44.25.” You can easily fold the rollers as it is double hinged for easy storage and transport. This is a portable and lightweight bike roller that features aluminum frames and alloy drums for easy transport and storage. It is lightweight and folds with ease into a compact roller for easy transportation. 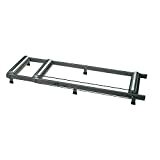 The sides of the rails are fitted with non-slip coating to ensure it remains sturdy and firm when enhancing its safety. The bike fits most wheelbases ranging from 42 inches upwards. The Professional Indoor Bike Roller is a compact pick and one that is designed with a sleek minimalistic design. It is an ideal choice for rooms with limited space giving users a more realistic ride indoors. This is a versatile roller that works for all types of bikes. It comes with three thermoplastic drums mounted in the adjustable frames to allow for any bike size. Move it freely within the house by folding it flat and enjoy exercises at any place in the house. The Minoura Roller is our best pick this year with a low profile for easier balance. This is the best indoor bike roller for getting fit without having to worry about bad weather. It has a front guard that helps slow the speed of the bike in case you lose balance. The wheels fold flat for easy storage and transportation. Overall, this is a versatile choice that fits wheels from 24 inches to 700c. Working out has been made easier as you don’t need to get out of your home to enjoy a bike ride. Get one of these amazing bike rollers today and starting riding in your home regardless of weather.